Create a navigation menu to easily manage your presentation. Navigation menus bring order and structure to a presentation. They usually consist of icons or keywords that are linked to individual slides. Just one click, and you’re on the corresponding slide. The menu bar remains visible, providing easy navigation from slide to slide. The advantage of navigation elements is clear: When you look at a standard PowerPoint presentation, navigation buttons always bring you to their assigned destination, no matter where they’re placed on the slide. This makes it possible to interact spontaneously. If the audience has a question about a previous slide, you can jump to that slide immediately with just one click –eliminating the tedium of clicking through each slide without tediously going back, slide-by-slide. 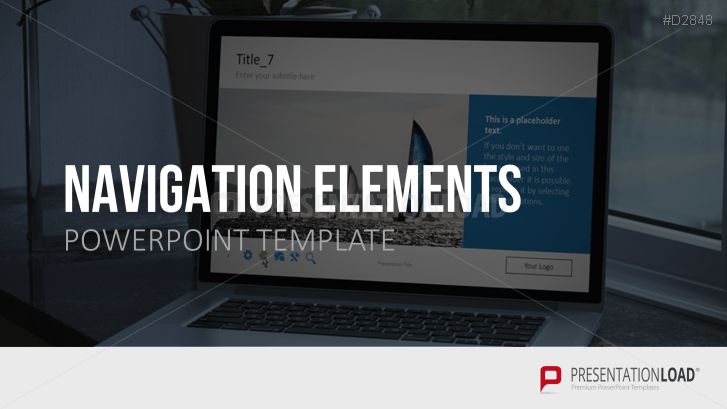 Navigation Elements contains an array of templates with a variety of elements for slide navigation, such as icons and text. Also included is an animated drop-down menu that structures and links content together. This menu is particularly useful for web style presentations. Categories, such as team, locations, and references can be easily combined and flexibly managed using the interactive menu.